Let’s be honest: It’s no fun to pull out your credit card for something that 1) isn’t a physical product, 2) you aren’t using every day, or 3) you aren’t necessarily obligated to pay. That instant gratification you get when ordering some goodies on Etsy, or Venmo’ing your friend money after an amazing dinner at that swanky restaurant downtown? Well, that warm, fuzzy feeling doesn’t really apply to insurance. Which is kinda strange, because it ultimately gives you peace of mind. We cannot help but wonder: if HO4 insurance protects the stuff that gives you that gratification in the first place and costs less than an avo toast per month, why aren’t more people buying it the minute they move into a new place? Maybe it’s that they don’t know which situations are covered, but even more, maybe they don’t understand the value of purchasing something like renters insurance in the present. 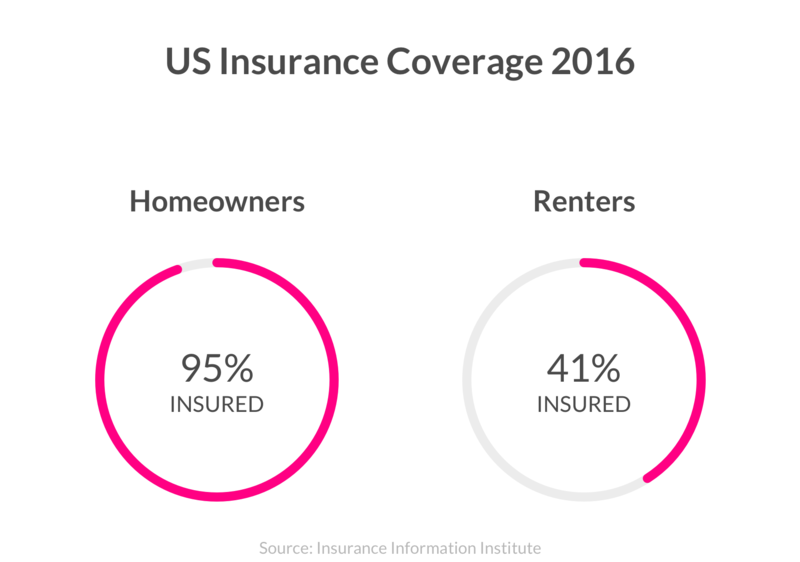 TL;DR: While the best time to buy renters insurance may not seem like ‘right now,’ it actually is (this is backed up by science!). Go forth and get protected! But when something bad does happen, your rationalization changes – you want insurance RIGHT NOW! There are a bunch of psychological factors at play here, but behavioral economics tells us that you’re more likely to get renters insurance if you’re facing a loss (i.e. your neighbor’s apartment was broken into, so you go buy a renters insurance policy), and you’re less likely to purchase insurance when you think you’re safe (read: you moved out of the big city, and don’t bother to renew your policy at your new place). The National Flood Insurance Program carried out a study that highlighted this behavior. They found that, on average, residents who lived in a place for 7 years only had flood insurance for 2-4 years. When you think about it, their place had the same chance of flooding no matter how long they lived in it, so why would they carry insurance for just part of the time? Probably because loss aversion (or lack thereof) – either they decided to get flood insurance only when facing a loss, or didn’t feel the need to renew when they no longer perceived a risk. For those of you behavioral econ enthusiasts out there, this is a double whammy of prospect theory and the framing effect at work. When your insurance policy is framed as a loss (losing $5), you probably won’t get one. But once it’s reframed as a gain (gaining $10k+ if your stuff is damaged), you’re a lot more likely to go ahead and get a policy. Moral of the story? Don’t wait for an “oh $%#&” moment to act. Renters insurance is totally worth the peace of mind, no matter when. It also offers some pretty awesome coverage that’ll come in handy when you least expect it. Whether you’re fresh out of school and moving into your first apartment, or a veteran renter, chances are you have a lot of stuff. And that stuff is worth way more that you think! Most renters have more than $10K of personal property. Now, would you be able to put down $10K tomorrow if you accidentally flooded your apartment? If your answer is in the range of “I don’t think so” to “Hell no!” then you probably should consider getting renters insurance. Bonus: Renters insurance covers you for something called personal liability: others’ medical bills, legal fees, injured guests, and accidental damage to other peoples’ places. Now for some good news. For a few extra bucks a month, you can insure stuff like your bicycle, jewelry, musical instruments, and other items of value, against all of the usual suspects (aka “named perils”). This type of extra coverage is known as scheduled personal property and will have your back in the case of accidental loss or damage. 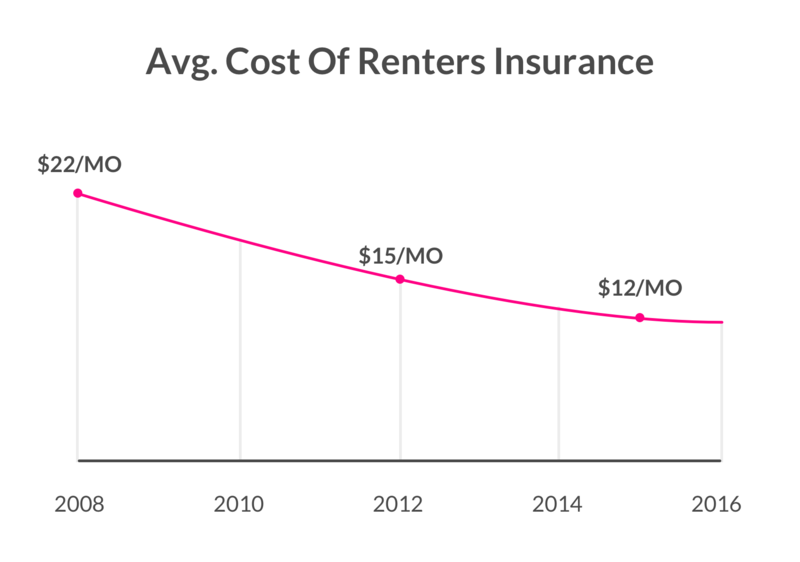 Back in 2008, the average cost of renters insurance was around $22 per month. But today, renters can get policies starting from $5 a month (less than the cost of your cappuccino). Think about the next time you order coffee, or buy lunch out rather than bring one to work. Think about that extra beer or glass of wine you drink while at happy hour, or that shirt you bought that is still sitting in your closet, tags on and all. Cutting back on just one of these things each month would free up a pretty small amount of $$ needed to purchase something huge: protection for you and your stuff. While you can purchase (or switch) renters insurance any time after moving into a new apartment, some apartment complexes require residents to have renters insurance before signing the lease. Not to worry, though. Most insurance companies will give you the option to declare a future start date, or effective date, in cases like these. One thing to remember is that your insurance won’t automatically transfer over if you move to a new place, so make sure to update your company if you’re on the move! Lemonade 101 explains the terms and concepts in your renters or homeowners insurance policy. This time, we tackle the question: what is a deductible? Let’s be real: Renters insurance isn’t the sexiest of topics. We get it. Thing is, it can have your back in a bunch of all-too-common situations, so it’s time to get down to business and start a conversation. Who Does Your Insurance Policy Cover? Lemonade 101 explains the terms and concepts of your renters or homeowners insurance policy. This time, we tackle the question: who does your policy cover? Renters insurance can be confusing. We’re here to clear things up, and give you the low down on what isn’t covered by your policy.